Whether you’re building a robot or configuring a monitor, begin your project by noticing the ambient light in your workspace. This reading may lead you to adjust the brightness of a clock or other display, or even set up an automatic nightlight that senses a darkening room. Light-dependent resistors (LDRs) are the key to building automated lighting. LDRs are useful and inexpensive, making them an excellent choice if you’d like to experiment without breaking the bank. 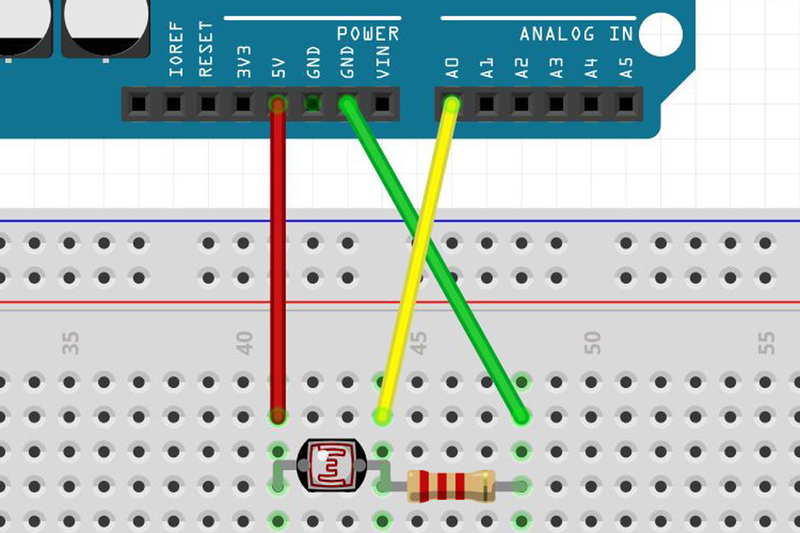 We’ll pair an LDR with an Arduino Uno board to demonstrate how they operate together. 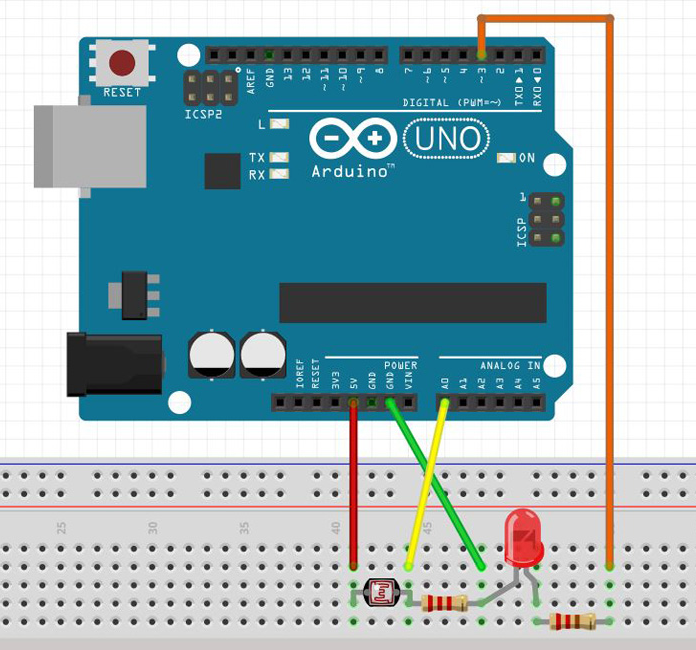 Hook up the circuit shown in the above diagram using an Arduino Uno (or adapt it to any dev board with an analog input). The fixed resistor used here is two kilohms, but higher or lower resistors may work better in your situation. 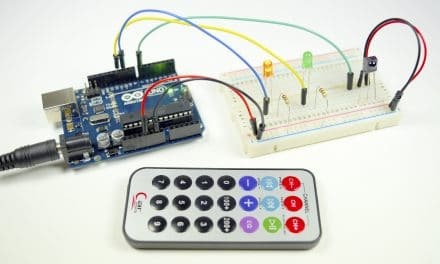 Once you complete the circuit, open Examples > Basics > AnalogReadSerial in the Arduino IDE, and load it onto your Uno. When you open the serial monitor up at 9600 baud, and you’ll see a steady stream of numbers from 0 to 1023 (indicating a voltage value of 0-5V scaled to a range of 0-1023) flowing down your console window. You may wonder why you’re unable to hook the LDR straight from the +5V pin to the A0 pin. While the LDR’s resistance does change, you don’t have a voltage divider in this setup. Whether resistance is relatively high or low, it’s all “seen” across the LDR component, fixing A0 at +5V. 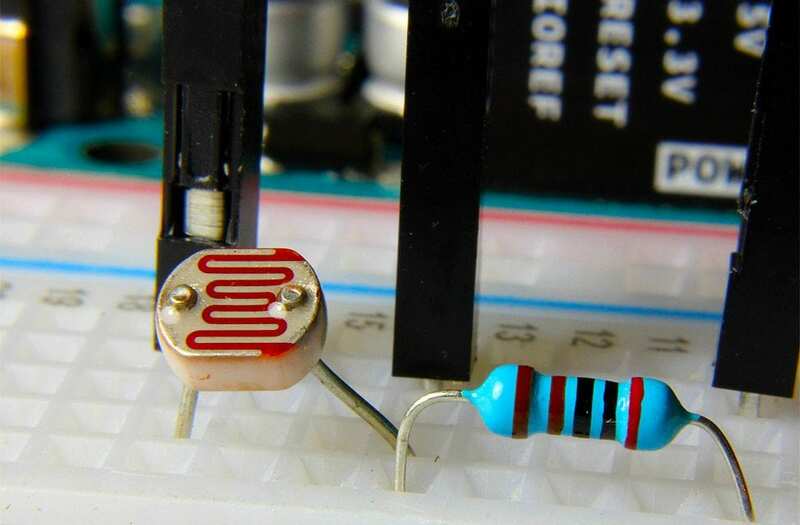 When you add the resistor to ground, it forms a voltage divider. Now the LDR must “spread” the voltage across the two resistors in series, and A0 senses the middle value. To see what happens without a voltage divider, pull the ground pin out of the circuit board temporarily. You’ll see the serial monitor number jump up to 1023, indicating that the full 5V of potential is set at that pin. The resistor on the left is 2 kilohms, and the resistor on the right is 220 ohms. Check its functionality with the Examples > Basics > Blink example sketch, changing LED_BUILTIN to 3 in the three places where the light flashes. 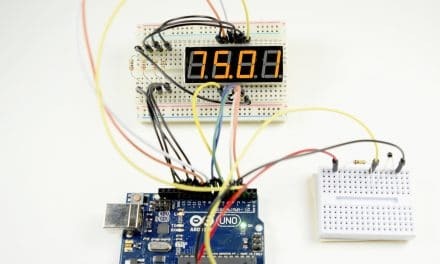 You can change the perceived intensity of the LED by pulsing the LED very quickly and changing how long it stays on each time it flashes—a technique called pulse-width modulation, or PWM. Load the code found here, a combination of the AnalogReadSerial example sketch used earlier, and another example sketch called Fading, located in the Analog drop-down menu. The code uses the “map” function to tie things together, scaling the 0-1023 LDR sensor input value to 0-255 for PWM output. Depending on the amount of light that the LDR sees (and thus the voltage at A0) the LED will brighten or dim as needed. 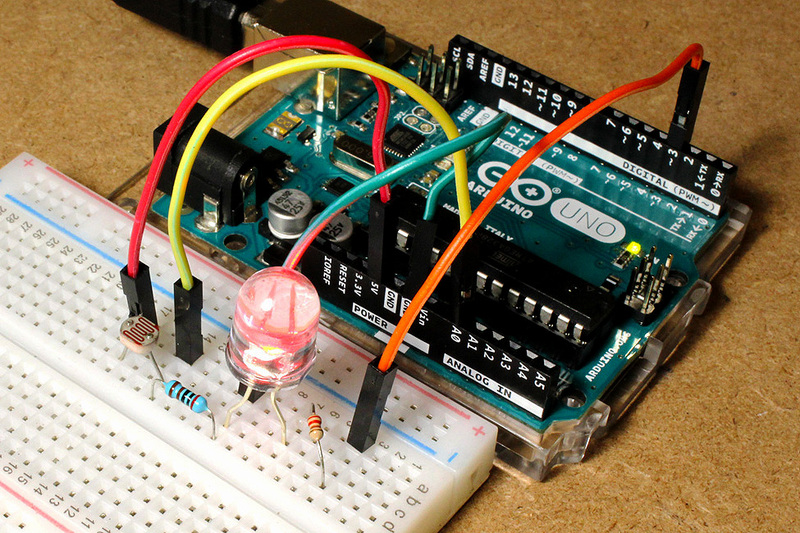 Pairing the LDR with an Arduino Uno helps make sure your LED doesn’t shine too brightly for its environment. 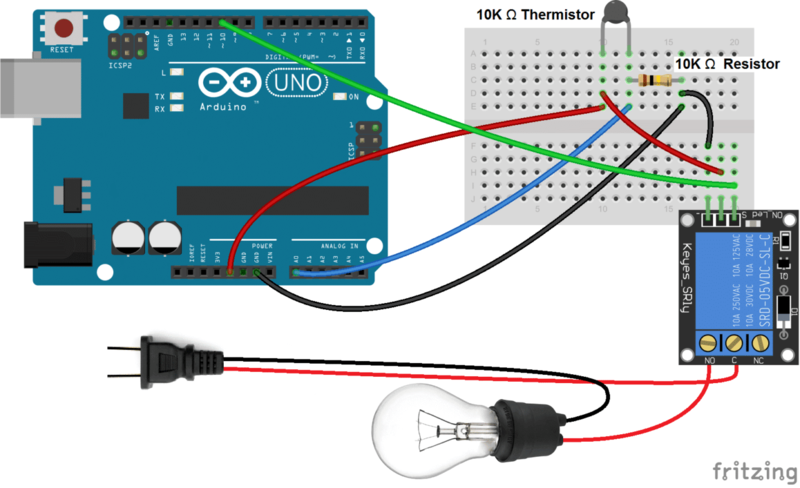 This application is just one example of how to use these inexpensive sensors in your workshop. Jeremy S. Cook is an engineer who has worked in manufacturing automation and writes for a variety of technical publications. Zach Wendt is a mechanical engineer with a background in consumer product development. 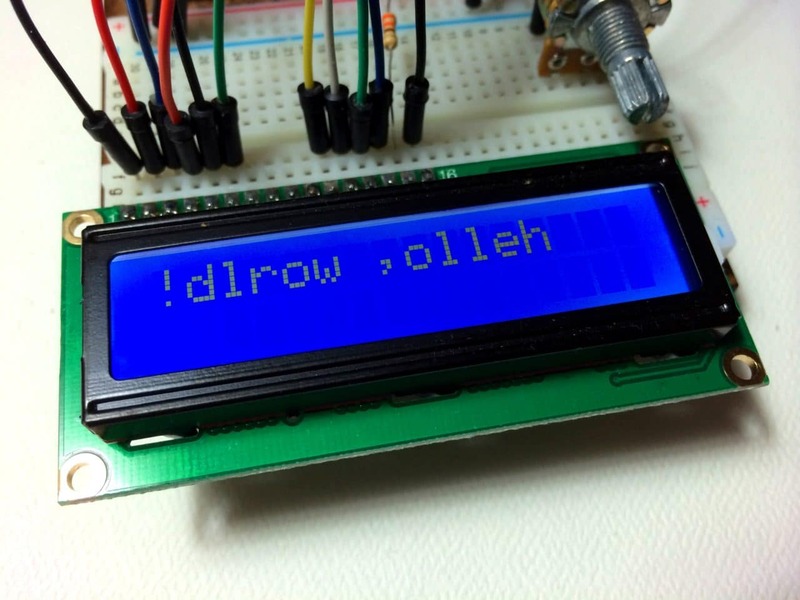 He works for Arrow Electronics, a major supplier of Arduino products.